Administrative medical assistants, also known sometimes as medical secretaries, have the opportunity to work in hospitals, doctor’s offices, clinics, and so many other places around the world. They check patients in at the front desk of their facility, answer the phone, schedule appointments, interview patients, compile medical records and charts, process insurance payments, and much more! The administrative medical assistant education should cover all of those things and more to help graduates be prepared to work as outstanding administrative medical assistants. Here are some of the skills that administrative medical assistants generally have that help them be amazing at their job. The best administrative medical assistants are those that are good at working with other people. Most administrative medical assistant jobs have you working at the front desk or in another secretary role at your facility. If you enjoy talking with other people, helping to coordinate their medical appointments and payments, and can provide exceptional customer service, administrative medical assisting could be the perfect option for you! 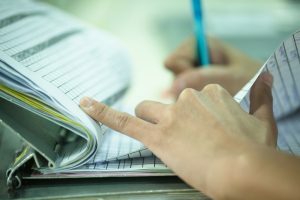 Depending on the type of medical facility you work in, you could also have a hands-on role with handling patient documents and helping the doctors with their record keeping. Regardless of their specific job duties, administrative medical assistants usually work with people. With the amount of appointments, documents, and charts that administrative medical assistants work with, it’s no surprise that people with good organizational skills can make excellent assistants! Managing calendars, tracking charts, and keeping everything sorted and organized is essential. Good administrative medical assistant programs can help students learn how to manage time, organize documents and charts, and even multitask. Learning good organizational practices can help you impress your future employer! Administrative medical assistants are often the go-betweens for doctors, patients, and insurance companies. They need to know enough medical terminology and protocol to be able to accurately record and recite information so that billing and insurance is handled properly. Administrative medical assistant programs can help you gain the foundation you need to be able to talk to people about those things, whether it’s explaining insurance benefits to patients or talking on the phone with insurance companies about coverage for different procedures and services. If you’re looking for an opportunity to expand your medical career possibilities, Blake Austin College can be your home away from home! Our administrative medical assistant program can give you a foundation to start a new career in the medical field or to expand your current career. Contact us to learn more about our administrative medical assistant program and how it can help you!